COMPOSITION participates in several events to make the project visible and to collaborate with like-minded companies and organisations. On 17th May, partners Atlantis Engineering, Kleemann Hellas and CERTH-ITI participated in the Technology Forum in Thessaloniki, Greece to communicate COMPOSITION and its offerings. The main scope of the conference was to present technologies that could be used to produce innovative products and services to enhance growth of the local environment and to reward cooperation by creating links between research and business communities in the wider region of Southeast Europe. COMPOSITION had an exhibition stand which attracted a considerable amount of attention. – The most appealing characteristics according to the crowd was the potential that the Integrated Information Management System offers in terms of interacting in a safe digital market that can connect all parts of the supply chain. People were also interested in the security aspect of the project which follows a security by design approach and includes local installations, authentication procedures and blockchain technology, says Dr. Ifigeneia Metaxa, International Projects Consultant at Atlantis Engineering. – In particular, the collaborative manufacturing services with the use of semantic ontology drew most of the attention. There is a fear that critical information gets lost in the big data pool. We show that annotation of data using semantics offers the ability to keep track of data and make better use of them in a machine learning context, explains Ifigeneia Metaxa. The 4th Technology Forum took place with the cooperation of 15 scientific committee members of Greece at the Technical Chamber (TEE) in Thessaloniki. The conference included numerous and interesting presentations, focusing on advanced infrastructure and cloud services, security, factories of the future, applications and services for smartphone devices, advanced voice recognition techniques, advanced simulation techniques of systems and attitudes, image and video editing. There were two parallel sessions followed by more than 180 guests. The first section was interactive with presenters and conference participants actively exchanging experiences and knowledge. 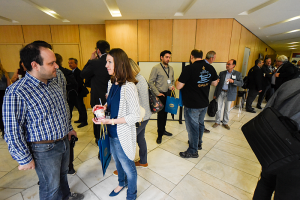 The second parallel session was a matchmaking event, promoting business, technological and research partnerships and bringing together the vivid ICT community from Greece, South-East European countries and beyond. At these pre-arranged meetings, innovative companies, universities, research centers and other organisations active in the wide ICT sector had a chance to expand their network, explore new ideas and develop cooperation potential. This action was organised by the PRAXIS Network, coordinator of Enterprise Europe Network-Hellas.